According to the American Camp Association, there are over 8,400 overnight camps in the United States alone. And yet with options all over the country, there’s something so special about Maine that makes it the perfect place to spend summers at camp – it’s no coincidence that Maine has the greatest number of the oldest, most established overnight camps in the country. While some of the advantages of attending camp in Maine might be intangible – there’s something about the smell of pine in the air that just captures the spirit of camp – there are many very real and exciting benefits to camp in Maine. From the beautiful natural environment, and the strong camp traditions, to exciting activities, and access to everything “Vacationland” has to offer – there truly is no place like camp in Maine. Every camper who attends a Maine Camp Experience (MCE) camp gets to experience the benefits of a summer in Maine on a daily basis. The climate is temperate and comfortable. The days are warm but not too hot – oftentimes in the 70’s and 80’s – and the nights are pleasantly cool, especially if you have your favorite camp blanket. Maine campers have access to daily waterfront programs on huge, natural lakes. On a warm Maine afternoon, there’s nothing quite like swimming in the crystal blue water, sailing in a sunfish, practicing stand-up paddle boarding, or whizzing around the lake on water skis. 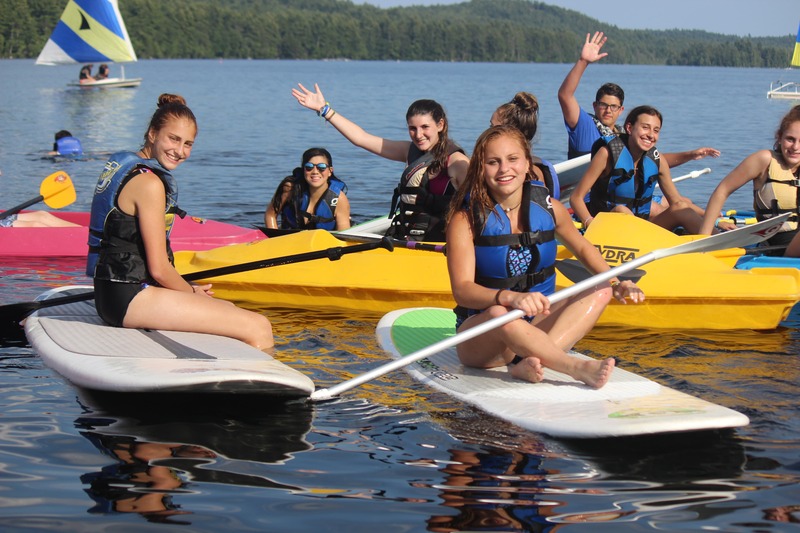 Maine’s Lakes Region is filled with beautiful blue, sometimes miles-long lakes, and MCE camps absolutely take advantage of this through their everyday programming, as well as scheduled camp trips like beach days. Maine’s proximity New England’s most stunning mountains makes Maine an incredible place to get in touch with nature. Each summer, campers ascend Mount Katahdin, Mount Washington, Franconia Notch, and others. They learn basic campcraft skills in Acadia National Park, and get to experience the reward of stunning panoramic views overlooking pastoral New England. Campers also experience exciting adventure activities like mountain bike trips or rafting down the Kennebec or Penobscot Rivers! And Maine’s natural beauty makes it an incredible place for kids to unplug. MCE campers disconnect from their electronic devices and focus on making human connections, which is a big part of the positive social development that kids undergo during their summers at camp. Campers get to enjoy Maine’s natural environment on wonderful camp trips – but these are not always about trekking and adventure. Other classic Maine camp trips include blueberry picking, or visiting cities and coastal towns like Portland, Boothbay Harbor, Bar Harbor, or Camden. And of course, Maine isn’t just for the campers – MCE parents love taking advantage of everything Maine has to offer, on camp tours, pre- or post-camp, and/or on Visiting Day. Families can take advantage of the active adventures, enjoy Maine staples like lobster rolls and whoopee pies and other delicious cuisine in Portland (the “foodie capital of the Northeast”), or explore Maine’s stunning art museums (the Maine Arts Museum Trail is a must for art lovers) – all while taking advantage of the variety of wonderful hotels, inns, bed & breakfasts, and spas that Maine has to offer. Of course, when families choose to send their child to an MCE camp, they’re not just doing so for the surrounding environments. MCE camps are first-in-class for many reasons. The camps are owned and run by experienced, passionate, involved, and caring directors who are admirable leaders, and who emphasize hiring and training top-notch staff. MCE camps have strong camp traditions and values – summers abound with campfires, and century-old stories and songs, and there is always a focus on building a warm community. These camps teach lifelong values such as resilience, confidence, independence, cooperation, sportsmanship, generosity, empathy, and magnanimity; and many camp parents are amazed by their development their child experiences during a summer at camp. Social action is also at the core. These camps have a longstanding commitment to engaging campers in philanthropic initiatives that show campers the importance of helping others. And campers have the opportunity to meet and make lifelong friends from all over the U.S. and abroad. Many of these relationships extend to college and life beyond. MCE camps also offer an array of incredible activities in the arts, land and watersports, nature, and adventure. With activities ranging from Archery to Zip-lining, there is something for every child. And with more than 30 premier, ACA accredited camps in Maine Camp Experience, families can find the best camp for their kids no matter their interests or desired session length. So while there may be 8,400 camps in the country – there’s only one Maine. And with everything Maine has to offer campers and families – from magnificent mountaintops to amazing activities and caring, invested owners and directors – there really is no place to spend summers like camp in Maine.